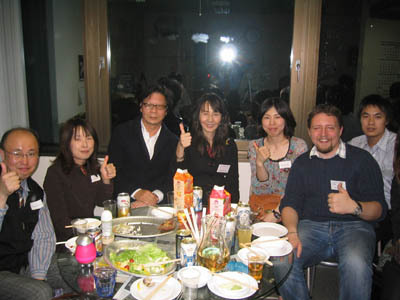 On the of 29th of January we had our monthly studio may party! Our Chinese teachers Oo sensei and Tansaku sensei made delicious Gyouza! Everybody had a great time! Everybody drank and ate. It was very fun! Our next party is on February the 26th! Please come if you can !!! 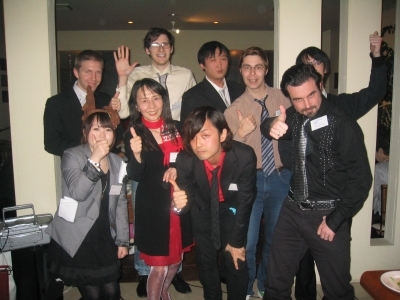 On December 17th, we held our annual Studio May Christmas Party at Restaurant Shyuoo. The venue was packed to maximum capacity as 50+ people attended. Some of us had to stand. 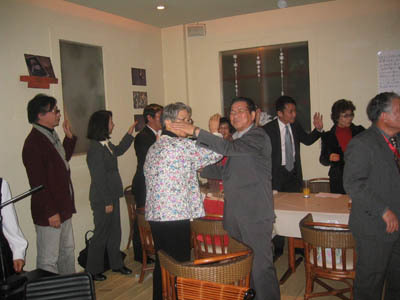 The Chairman of Sapporo UNESCO and the Vice-chair of the Japan China Society gave a speech. We also bid a heartfelt farewell to Rikard-Sensei, who will leave us at the end of the month after a 3 year tenure at Studio May. 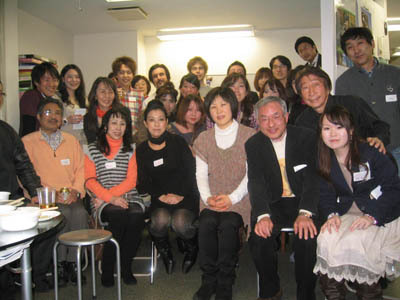 Music was provided by our singer/songwriter piano man, Kousei Uematsu, who set the festive mood. The evening was punctuated with games, quizes, prizes, singing and dancing, and a visit from Santa Claus. 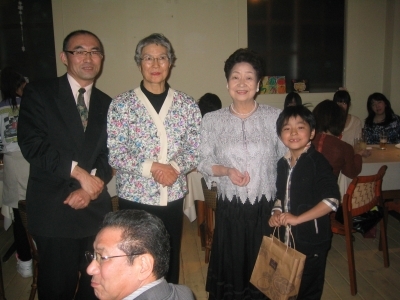 May Sensei and the Chairman of Sapporo UNESCO and the Vice-chair of the Japan China Society, along with our youngest guests toast the evening. 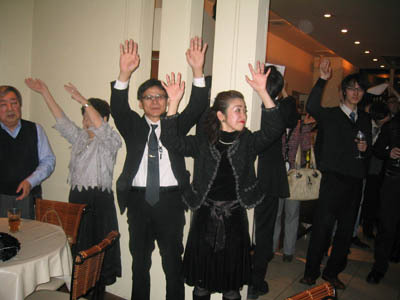 Teachers and students "increase the peace." Teachers, students, and guests enjoy the lovely French cuisine. The finalists in our Janken showdown. 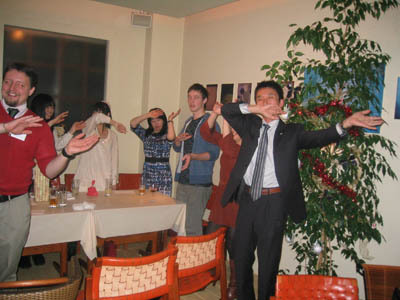 Students, staff, and guests dance to SMAP's "Sekai ni Hitotsu Dake no Hana"
It sums up the of motto of Studio May. But everyone can be great at something. On October 2nd, the C.C. 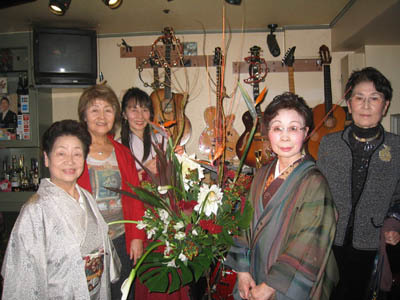 Club (Cosmic Candies) put on its fourth "Uchu no Hana" event in Susukino. 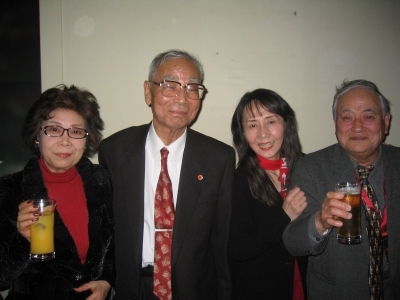 There was a collaboration between famous Joumon era drummer Mr. Moro Goushin and Komay Kojima(teacher May). 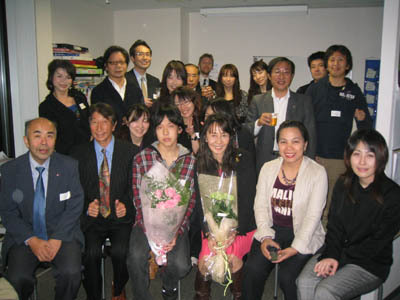 Many people attended the event, and everyone had a good time. 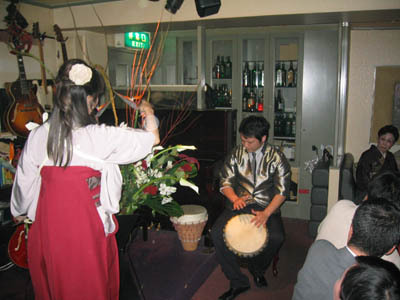 Finishing touches are added while Mr. Moro Goushin keeps the beat. 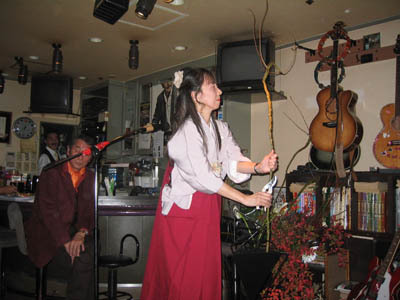 May Sensei trims a branch as her creation begins to take shape. May Sensei shows off her traditional outfit. 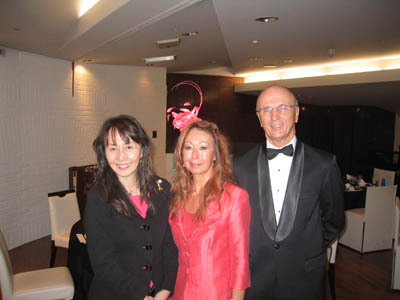 We would just like to congratulate our English instructor Ian, who recently had his wedding ceremony. 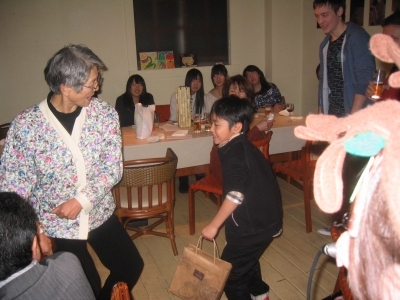 May-sensei was there, too, even though it was on the same day as her birthday party. 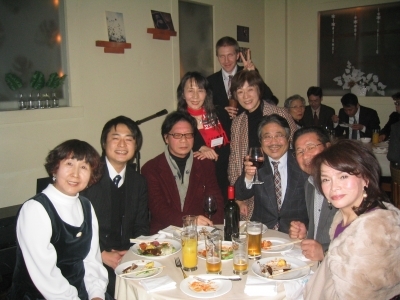 Ian's parents and his friends from abroad also attended, and everyone had a great time. Congratulations! 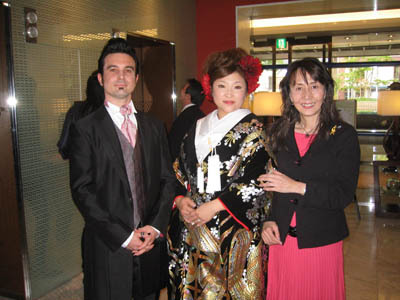 The bride and groom with May-sensei. 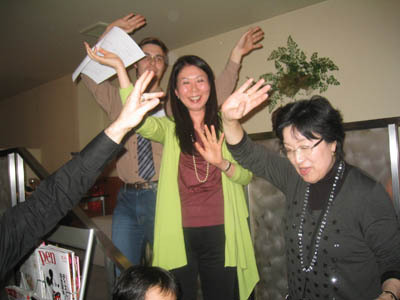 This month, we had our monthly party on the 16th, and the reason why it was this unusually early was that it was May-sensei's and one of her student's birthday! A happy birthday to them! Students of all ages, teachers of a variety of languages and several guests gathered, and ate birthday cake as well as delicious Paella made by Mr. Onishi. Everyone had a great time together! We hope to see you all next month, and we will let you all know the time of the next party through e-mail or a blog post! Everyone gathered for a picture! 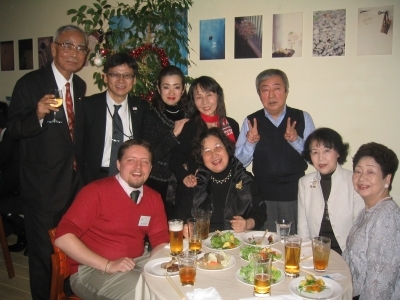 Merissa-sensei, Rikard-sensei, May-sensei, a guest and two of our students. 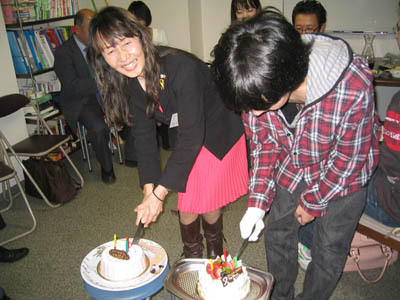 May-sensei and her student Ryota cutting the birthday cakes. Everyone liked Mr. Onishi's food. 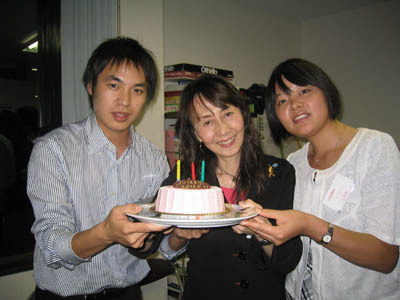 May-sensei with two of our Chinese teachers. 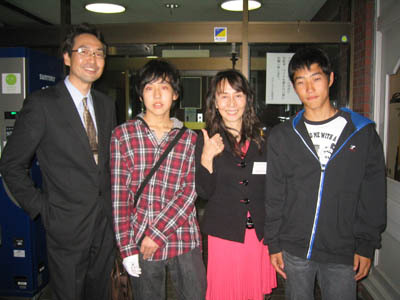 Our students Keita and Ryota with their uncle and May-sensei.